Ellesmere Island is the most northerly island in the Canadian Arctic Archipelago. Extending from approximately 76° to 83° N, it is also the most northerly landmass in the world, with the sole exception of the northern tip of neighboring Greenland. The island's northern coasts are less than 800 km (450 miles) from the North Pole. The island's extreme northernness has defined the parameters of much of its natural and human history in all periods, including the present. the island is a mountainous mass of rocky terrain, incised by fjords and channels extending far into the heart of the island. The island possesses both the highest and the longest alpine ranges in eastern North America (highest point, Barbeau Peak, 2616 m), and is also the site of the largest ice caps in Canada (Agassiz Ice Cap and Grant Land Ice Cap); its glaciers cover a total area of 83,000 km2 or 40% of its surface area, and comprise more than half the total ice cover of the Arctic Islands. Characterized by very cold winters and cool, brief summers, Ellesmere Island's climate is characterized by extremes. Conditions are particularly severe in the interior regions, where temperatures of -56°C (-70°F) or lower have been recorded in the winter. Nevertheless, 24-h daylight during the summer raises daytime temperatures above freezing, causing water to flow from the ice caps and fostering plant growth in the valleys and lowlands. Annual precipitation is extremely low (60 mm in the north). 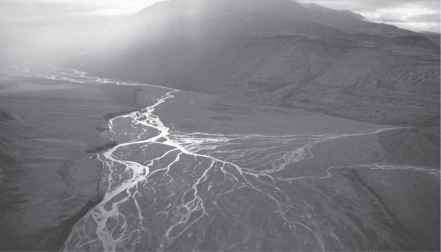 The physiography of Ellesmere Island is the product of complex geological processes operating over millions of years. These processes have been varied, including folding, uplift, volcanic activity, and sedimentary deposits, resulting in a complex collection of landforms. Overall, the landmasses of the Arctic Archipelago have been shaped by two periods of uplift: (i) before the Pleistocene era and characterized by faulting, during which the overall character of the islands was established, and (ii) a later period of uplift probably related to isostatic rebound after the partial melting of the great ice caps following the last Ice Age. Macdonald River delta, Ellesmere National Park, Nunavut, Canada. Copyright Bryan and Cherry Alexander Photography feature is Lake Hazen, a huge freshwater lake located in a trough along the southeastern flank of the Garfield Mountains. Approximately 80 km in length and between 5 and 13 km in width, it is the largest lake in the world north of the Arctic Circle. The lake is drained by the Ruggles River, which flows into the ocean to the southeast. Protected by the United States Mountains from the brunt of cold winds from the Arctic Ocean, this region is an "Arctic oasis" or an area of extensive vegetative growth during the short summers. Here, plant species such as Arctic willow (Salix arctica), water sedge (Carex aquatilis), and purple saxifrage (Saxifraga oppositifolia) support resident populations of muskoxen (Ovibos moschatus), Peary caribou (Rangifer tarandus pearyi), wolves, and other species of mammals. The earliest evidence of human occupation on Ellesmere Island is represented in archaeological sites of the Arctic Small Tool Tradition, from the Independence I culture, c.4400-4000 years before present (BP), to the late Dorset people to c. 1000 BP. Members of the Thule culture, forerunners of the Inuit, arrived c. 900 BP. Following the onset of the Little Ice Age c. AD 1400, they largely withdrew from the High Arctic, although brief forays into northern Ellesmere Island continued until c. AD 1700. In the 1850s, Qitlaq (Qillarsuaq), a shaman from Baffin Island, led a party of Inuit on a journey that skirted Ellesmere's southeastern coasts and ended in northwestern Greenland. Prior to contact, Inuit from the Arctic Archipelago and Inughuit from Greenland called the island Umingmak Nuna, meaning "Muskox Land." Bylot in 1616. During the Race for the Pole, c. 1818-1940, Ellesmere Island was a focal point of a series of expeditions by British, American, and Norwegian explorers. In 1852, Commander E.A. Inglefield sailed to northern Baffin Bay and named the island after the Earl of Ellesmere, the vice president of the Royal Geographical Society. In 1875-1876, the British Arctic expedition under Captain George S. Nares wintered in northern Ellesmere Island, as did the US Army's Lady Franklin Bay Expedition in 1881-1884, led by Adolphus Greely. Between 1898 and 1902, the American Robert Peary staged three North Polar expeditions that wintered on the island and crisscrossed its interior in search of game animals. Britain transferred Ellesmere Island, along with the other islands of the Queen Elizabeth Archipelago, to Canada in 1880. After 1900, expeditions led by A.P. Low (1903) and Captain Joseph Bernier (1906-1910) asserted Canadian sovereignty over the region. 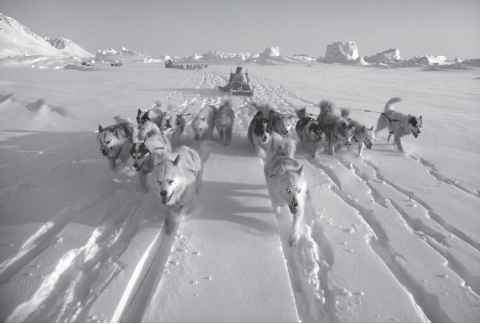 Between 1922 and 1940, the Royal Canadian Mounted Police established detachments at Craig Harbour (1922-1926; 1933-1940) and Bache Peninsula (1927-1932), from which it carried out extensive patrols by dog team over much of the High Arctic. Between 1951 and 1974, the Defence Research Board coordinated a major interdisciplinary program of High Arctic science from bases in northern Ellesmere Island. In the late 1940s, Canada and the United States established joint weather stations in the High Arctic, beginning with Eureka on Slidre Fjord in west-central Ellesmere Island in 1947, followed by Alert, on the island's northeastern tip, at 82° 30'N, in 1950. Alert was subsequently developed into a military base during the Cold War, although its operations were significantly scaled back by 1998. In 1953, the government of Canada relocated several families of Inuit from the eastern coast of Hudson Bay and northern Baffin Island to Craig Harbour on the southeastern coast of Ellesmere Island. Moving again in 1956 to Grise Fjord (76°25'N), about 60 km to the west, this community has persisted for half a century as Canada's most northerly permanent settlement; its population was 160 in 1999. Inuit have given this community the name Aujuittuq or Ausuittuq, meaning "the place that never thaws." More than one-fifth of the island is protected. In 1988, in the most northerly part of the island, the government of Canada established Ellesmere Island National Park Reserve, the forerunner of Quttinirpaaq National Park of Canada, the country's second largest national park.